At Gardenview Bed and Breakfast our goal is to make you feel at home in our comfortable yet elegant surroundings.From our home and yours to share, we offer two quiet rooms for our guests. 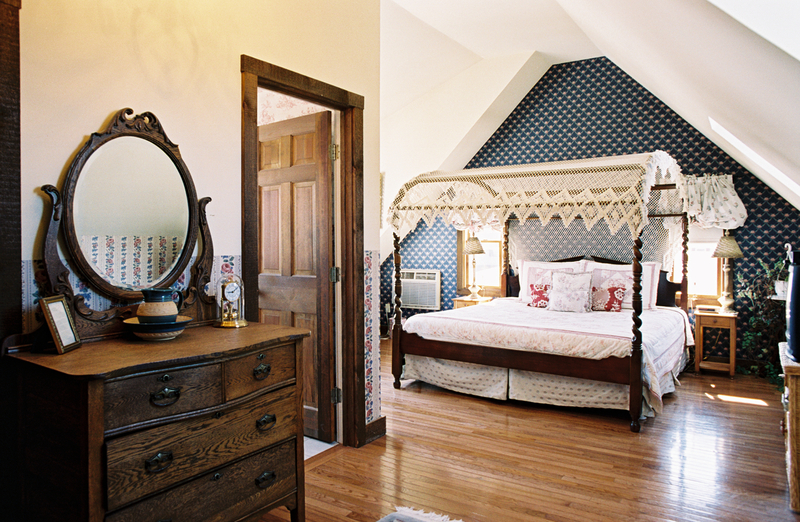 Our Sun-Lit Suite is a large, yet equally cozy room also decorated with antiques. It includes a king canopy bed, a private whirlpool bath for two, electric fireplace, color cable TV, and air conditioning. A large window and lounger face the water and perennial gardens so one may view the flowers and colorful fish. Our Garden Room provides an excellent view of our various gardens and includes a warm cozy antiques filled room, a private whirlpool bath for one, electric fireplace, color cable TV and A/C. Sliding glass doors open onto a brick patio so one may enjoy our lovely, peaceful gardens. Relax, Settle-in and Enjoy our beautiful Guest Rooms! I booked this B&B because it appeared to be the nearest to the Newport Jazz Festival on the map and was stunned by the beautiful accommodations when I checked in. The upstairs room is huge! I felt a bit like a princess in there. The backyard is truly a labor of love with all the beautiful flowers, and I took some time out of my schedule one day just to sit and bask in the relaxing setting. The hostess is very kind, and the neighbors are friendly. There is nothing here to dislike. Guys choice: hard to please when it comes to food and home run. Relax in the backyard garden and watch the birds eat of the feeders or just admire the many different variety of flowers and plants in the garden. Walk to town is about 18 min, very easy as 30yr/m and 36yr/f had no difficult at all -- just bring a tiny flashlight if you expect to walk back after sunset or at dark. Large park, tennis court, basketball and swings are 3 min walk away. 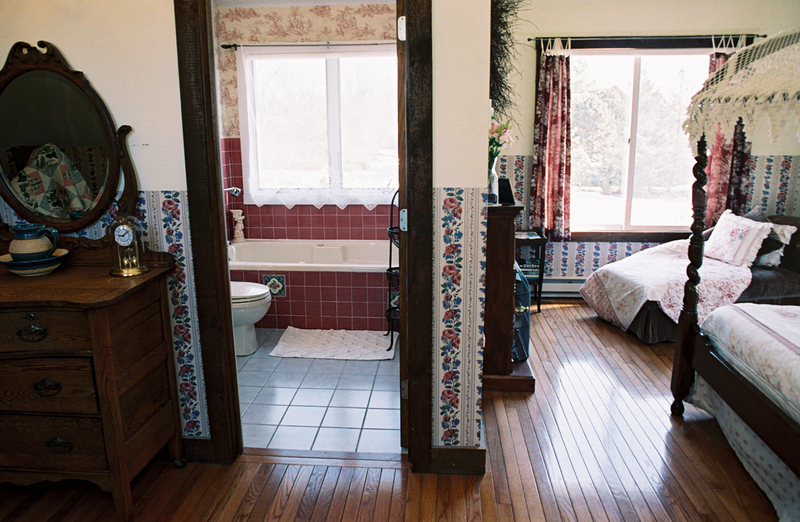 The bathroom is relaxing, take shower or bath in med. size tub. Price is much cheaper than others as July is expensive elsewhere when you include breakfast and other costs. 2 rooms only available (King upstairs or Queen downstairs) so stay will be peaceful and romantic. Except that walls are thin, so if you are to watch TV at night, better lower the volume or expect someone from the other room to come knocking... Have it your way, and make it count. We enjoyed our mini vacation at Gardenview B & B, even though the weather did not co-operate - windy and cold. We toured three of the mansions - located very close to this B & B. The Gardenview is in a nice, quiet neighborhood. We stayed in the Sun-Lit Suite upstairs - a large room with comfortable king-sized bed and a large picture window overlooking the garden in the rear of the house. Mary was very gracious, friendly, and looked after our every need. My only suggestion would be to add a separate shower in the bathroom; otherwise the whirlpool bathtub was enjoyable. Thanks for making our short get-away trip memorable.